The paths of Yoga, or the defined joining and union of mind, body and spirit can occur in different ways. Yhere are different paths, for diferent people. The Yogis understood the different natures of individuals needed different alternative options to achieve liberation and thus different paths of yoga evolved. Raja - Meditative connection with the divine. Kundalini, which represent the the evolution of Yoga practice from earlier orgin to modren day practice. Karma means 'action' and thus this is the path of leafless service to others; the giving of your time and skill to help others without wanting or expecting reward. For example, during a stay at an asharam guest are required to dedicate a small amount of their time to the upkeep and running of the asharam, this is known as sewa or service. A karm aYogi attempts to see the divine in everything. Karma yog ais the central theme within the Bhagwat Gita and Yog Sutrsa " we must involve ourslves through action; but leave the rest to God and expect nothng. Bhakti Yoga is the yoga of devotion and service to a divine being. Chanting, singing, regular prayers, japa (repeating a mantra or name of God) and celeberations are all form of Bhakti Yoga. Jay Ganesha is a twice-daily chant of the sivananda devotees, which calls upon Loprd Ganesh, the remover of obstacles, and many other deities to help them clear the way to Smadhi or spiritual bliss. The Maha Mnatra of the Harikrishna movemnet is chanted to help liberate the aspirants by the repetion of Hare Rama Har krishna, which is used to draw the mental focus towrds Lord Krishana. The Japa repetions of mantras help to focus the mind into a state of klnown as ekagrata (onepointed). This continued focus helps to still the chatter of the mind which is considered in yoga to be one of the reason we cannot find the peace and tranquility, and thus cannot rest in our own true nature. A mantra can be a single syllable. a number of syllables or a verse. that is chanted regularly to offer protection to the person to whom it was given. The mantras is usually given by a guru to a student when they know exactly what the student needs. 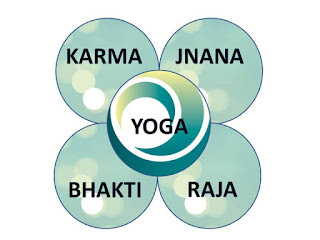 Mantra yoga is believed to have the same effect as Bhakti and Jnana Yoga. 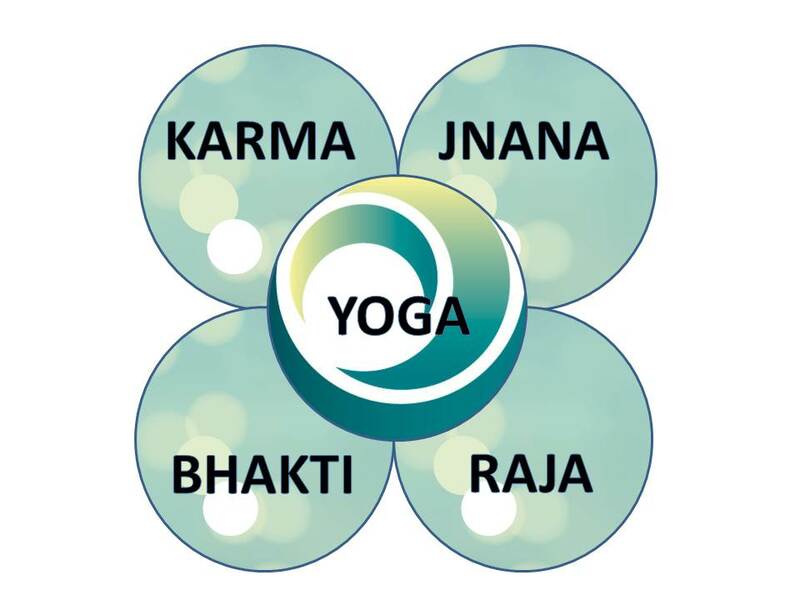 Jnana Yoga in sanskrit means knowledge, and is the path of wisdom and intellect. Through the study of ancient texts, philosophical discussion, intellectual debate with others and introspection, 'that which is within us' is revealed. Sivananda suggests this to be the most direct of the paths. but also the most difficult as the aspirants needs to be firmly grounded in the other disciplines before attempting it. this form yoga is for the more studios personality. Raja Yoga, also known as the 'royal path' is the journey towards personal enlightenment. The mind is systematically analysed and techniques are applied to bring it under control ( reduce its restlessness) and achieve samsdhi or higher state of consciousness (the king within). Raja yoga is about recognising the divine, the 'king' within ourselves and allowing him to take his rightful place. This 'king' may be known as GHod, Isvara or Purusha or as the same divine being celebrated in Bhakti yoga. The yoga sutras describe Kriya yoga as a whole spectrum of practices. the kriya yoga system of yoga was revived in modern times by Lahiri mahasaya. It was Parmahansa yogananda who brought it into widespread public awareness. Tapas : disipline. Includes practices such as asana and pranayama to remove blocks and physical obstacles. Svadhyaya: self study. Asking ourselves questions to explore who we are and what is our purpose. Isvara Pranidhana: surrender. Surrendering to divine and dedication to a higher principal of purpose,'action (is) not motivated by outcome'. These three combined practices are kriya path and lead to a reduction in the kleshas (spiritual obstacles, which includes avidya) and bring about a felling of meditative absorption. In Hatha, kundalini and tantra yoga practice, Kundalini is a central concept, as are the nadis chakras, sushumna and prana. Kundalini Yoga emphasizes the the concept of Kundalini. Tantra Yoga emphasizes the containment and direction of certain energies to remove obstacles, rather tha wasting these energies. The teaching which inform the practice of each path are different, but ultimately, they are all aiming the same goal - the union of the body and inner divinity.